When parents reinforce organizational skills at home, they become habits that increase a teen’s effectiveness across the board. A home environment free of distractions and interruptions greatly boosts your teen’s efficiency. Parents play a critical role in creating this tone to help their teens. Keep a neat notebook with school papers separated by class with notes, tests, handouts and homework. Write down homework assignments and their due dates in your planner. Ask the teacher questions before leaving class. Bring all books and materials home for study and homework. Study with a partner, if appropriate, for languages or reviewing for tests and quizzes. After studying, put all materials together to take to school the next morning. Look online at grades from teachers every few days. Before going to bed, put all school stuff by the door so you have to trip over it going out the door. Toss papers randomly into books and notebooks. Try to study in a cluttered or noisy area. Interrupt your study time with texts or phone calls. Scribble homework on scratch paper or rely on your memory. Listen to loud music or TV while studying. Go to bed without organizing your school stuff for the next day. Click here to read/print a PDF file version of this post. This entry was posted in For Parents, For Students, Tip Sheets on January 26, 2015 by Karyn Rashoff. Are You Teaching Your Teen to be a Victim? 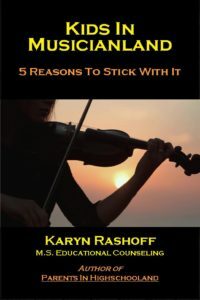 CHECK OUT KARYN'S 2ND BOOK! Karyn is a Goodreads author! BarkingDogBooks is thrilled to announce that "Parents in Highschooland" will be represented to schools, universities and libraries by Brodart Company. 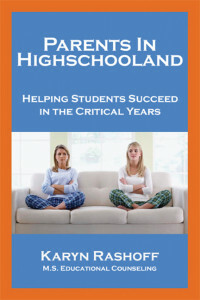 You are invited to write a review of Highschooland on Amazon.com, BN.com and/or Smashwords.com.